Need a cure for insomnia? Play this. We'll say this about Desert Quest: we love its style. 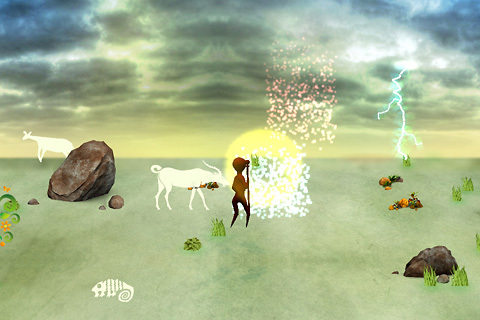 Sad Cat Studio's iPhone only video game features a hero and animals designed to resemble ancient cave drawings. Suffice to say, it looks like nothing we've seen before. As for the actual game, it's average at best. There's a paper thin story in there somewhere involving a kidnapped princess, but it's of little interest compared to the gameplay that involves killing enemies and finding keys to proceed to the next level. Of course, Desert Quest is a bit deeper than that. Along the way, you'll combine gems to learn magic spells, solve puzzles and purchase equipment at the game's store, upgrading from a relatively weak bow and arrow to a powerful club; you can also buy armor. It's a decent concept backed by some interesting visuals, which is the primary reason we coughed up the $1.99 to download the game. Sadly, the product fails to measure up. Animals have a tendency to gang up on the hero, making it difficult to move around, and the entire experience is mind numbingly repetitive, to the point that we fell asleep multiple times, only to wake up with the iPhone on our laps and one dead warrior. It also doesn't help that combat is a snooze fest; the hero's doesn't swing the club so much as he twirls it around, while the arrows slowly float through the air. In the end, Desert Quest is just too blah to enjoy, and the fact that there's no iPad version (or at the very least, universal support) is another strike against it. Don't let the attractive artwork trick you into spending two bucks. Leave this one in the past. 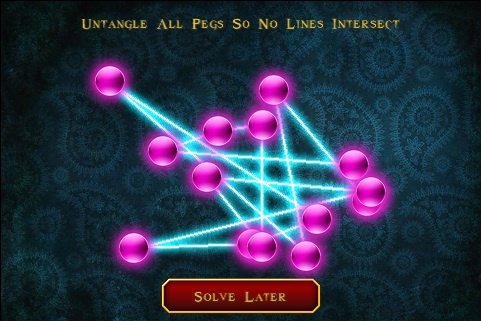 What's Hot: Cave drawing graphics, some cool puzzles. What's Not: Cheap enemy attacks, unimpressive weapons, extremely repetitive, no iPad version.